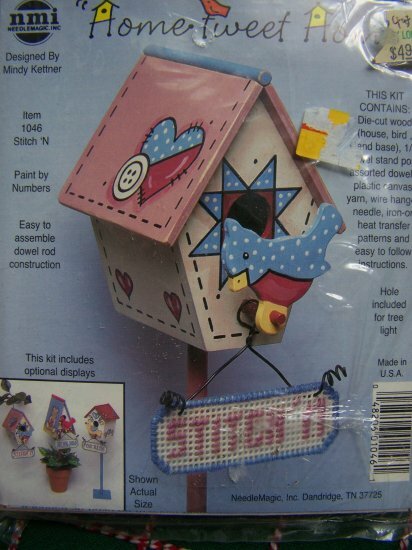 Sew Unique Treasures And Gifts 1 cent USA shipping special - Home Tweet Home Birdhouse with needlepoint STITCH'N in yarn that hangs below the house. Paint by number, easy dowel rod construction. Complete sealed kit. More new and vintage cross stitch, needlepoint, embroidery patterns, kits and back issue magazines listed. Finished size; Birdhouse is about 3" tall. KIT contains die cut wood(house, bird,stand base) 1?4" dowel stand post, assorted dowels, plastic canvas, yarn, wire hanger, needle, iron on heat transfer patterns and easy instructions. Hole included for tree light. S & H to USA is 1 penny first class. I use priority flat rate envelopes for $5.00 shipping and can fit a lot of patterns inside. S & H to Canada is $4.00.